Studs and a laser-cut design bring an artisan edge to this colorful mule. 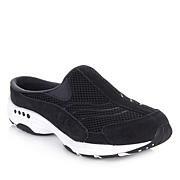 The foot-liberating moc feels cool and comfortable on, stylishly placing a dominating shoe trend at your feet. Pair these soft suede slides with everything from skinny jeans to flirty frocks and up your fashion game, Minnetonka style. Fun red shoe that is stylish and comfortable. True to size and love the color that is great !! I love these shoes! Very comfortable and attractive. Very comfortable. I ordered the red and the color is very vibrant. The price was great. I would definitely buy again. LUV this Shoe its like a Flip Flop for Fall and Winter !! Thanks I have bought the Hot PINK,TUR and the Light BLUE Tan !! 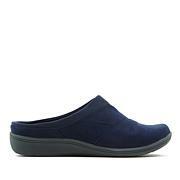 Great comfort and ease with mule style. I wear these every day. Excellent quality. I ordered two more pair. What's the best way to support your healthy lifestyle? Start from the ground up. These cozy, slip-on mules feature copper-infused footbeds, lightweight, treaded outsoles and Balance orthotic insoles for the best in style and wellness. 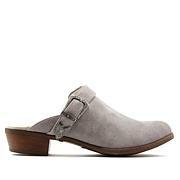 With endless options for wearing, this mule boasts a bit of spring and summer with every strep. A genuine leather upper with easy-to-care for leather-like straps make it a breath of fresh air ... in footwear form at least.